Warner singer-guitarist-songwriter Carl Beverly will headline the Andover Coffeehouse on Friday, April 19. 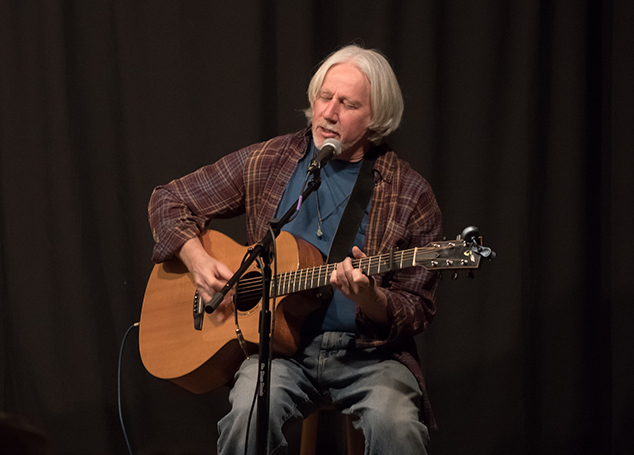 Because a family emergency is preventing the previously scheduled featured performers from appearing at the Friday, April 19, Andover Community Coffeehouse, Warner singer-guitarist-songwriter Carl Beverly will instead receive top billing for the evening. He will be joined onstage by his wife Carolyn. Also appearing onstage will be up to a dozen open-microphone performers, whose contributions in previous months have ranged from the spoken word to show-business, jazz, folk, bluegrass, and country-and-western tunes. Doors to the Grange Hall open at 6 PM for food purchases offered by the Andover Community Church, and for open-mic sign-ins on a first-come, first-serve basis. The performance will begin at 7 PM in the Highland Lake Grange Hall, 7 Chase Hill Road in East Andover. Admission is free, although donations — which are shared with the performers and the Andover Community Church, owner of the Grange Hall — are gratefully accepted. Sponsors for the April concert are two “Friends of the Andover Community Coffeehouse” who wish to remain anonymous. Sponsorship funds help support the ongoing renovation of the Grange Hall.